Startup EEG-Monitor by Configuration file name error. Sometimes during reinstallation of the EEG Monitor software it is possible that the 'Configuration file' is deleted and not reinstalled. When the program is startup under that conditions the next error is on the computer screen. Press the 'OK' button. Now the main program part with the main menu of the EEG Monitor is visible at the top of the computer screen. Select now the 'System Configuration Editor' from the main menu and select the menu item: 'Create new system configuration'. Now the 'System Configuration Editor' screen is shown on the computer screen. There are two list boxes visable. The upper one: 'Device Type Database' This list box contains all the type of devices that can connect to the Ethernet Interface. From this list box a selection must be made which device is used in the configuration. Select with the mouse pointer the device that is needed for the configuration from this list (use if necessary the scroll bar) In this example a BRAINBOX EEG-1166 amplifier 'type A' is used. After the device is selected press the 'Add Device Type to SCT' button. Now the selected device is in the second list at the bottom of the dialog. The name of the list is 'System Configuration Table' This list contains the selected devices that will be use for the system configuration and what will be send to the Ethernet -102 (V2) Interface. It is possible to place more devices in this list but there are rules for selecting. The next step is to update the internal System Configuration Table of the EEG-Monitor. This is done by pressing the 'Update Configuration' button. The last step is to save the configuration that was created. The program generate a default configuration name but it is possible to change this name in the field: 'Configuration Name' The Configuration will be saved by pressing the 'Save this config' button. After pressing this last button the complete dialog is closed. The Sample Rate and the Patient KEY can't be changed in this version of the EEG-Monitor. The next step can be to make a connection to the Ethernet -102 (V2) Interface or first close the whole application to be sure that a new version of the configuration.INI file is saved. After that start again the EEG-Monitor. 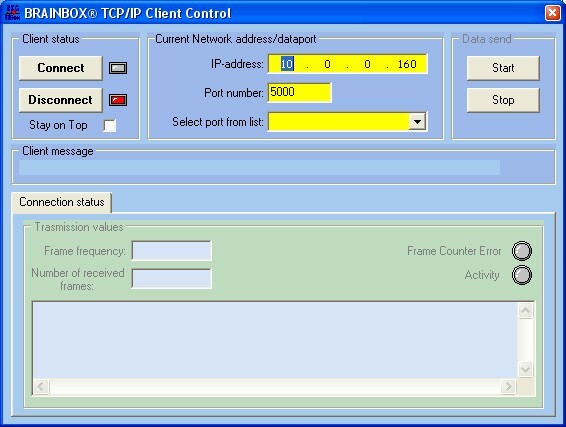 Fill in the right IP-address and port number and press the 'Connect' button to make a connection. © 2009 by BRAINTRONICS. All rights reserved.